NCSoft reported their Q4 2018 earnings report today that showed ~$354M in revenues for the quarter, which was flat quarter over quarter. NCSoft also released their Q4 2018 sales by franchise figures as well as their year end sales by franchise figures. Mobile games and Lineage were flat quarter over quarter while Lineage 2 sales soared (likely due to a big content update / release of Western classic servers). The rest of NCSoft's franchises trended down for the quarter with Guild Wars 2, Blade and Soul, and Aion reporting the lowest quarterly sales numbers for the year. A look at yearly revenues by franchise paints a different picture though. Guild Wars 2, Lineage 2, Lineage, and Aion are all pretty steady, but Blade and Soul has shown big declines year over year. Keep in mind 'Blade and Soul' here only refers to the PC version of the game, not the numerous different mobile games in the franchise. 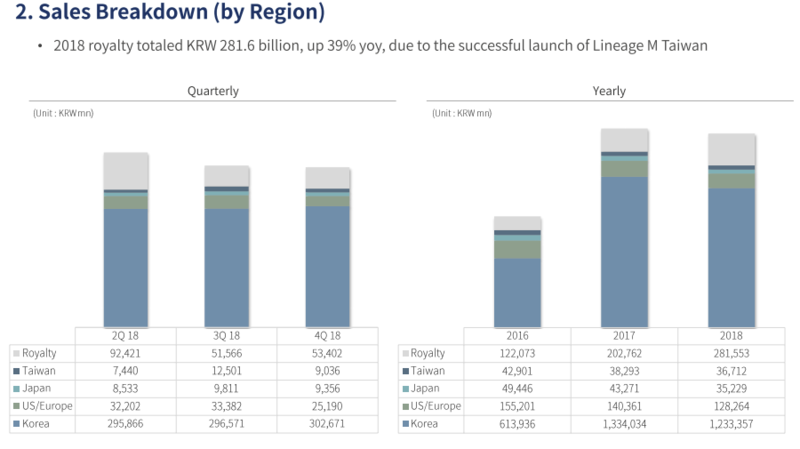 As always, NCSoft's primary markets remain South Korea and China, with South Korea making up the vast majority of the company's revenues. NCSoft continues to be a gaming powerhouse and is one of the world's largest gaming companies. The company is currently valued at about $8.6B and continues to grow.